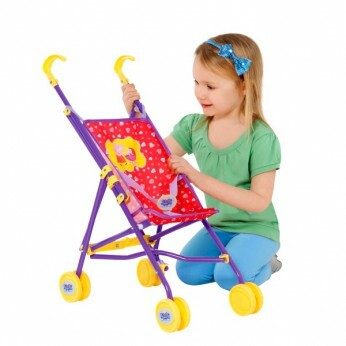 Peppa Pig single buggy with easy grip handles and double wheels for extra stability. Folds flat for easy storage. Suitable for dolls up to 40cm. Handle height 55cm. Styles may vary…. This toy costs approximately £7.99 (for the latest and best prices make sure you check our retailer list for the Peppa Pig Stroller above). In our review of Peppa Pig Stroller we classed it as being suitable for ages 3 years, 4 years, 5 years but recommend you check the manufacturer specific advice before purchasing.